Make plans to visit the pool this summer! Join a public event or reserve your own party! The staff at the Irwin A. and Robert D. Goodman Pool are here to assist you in making your next birthday party, family reunion or company picnic a huge success! From ice cream socials to elegant catered events, Goodman Pool is the perfect place to have your next event! Call (608) 264-9292 or email to book your private party. Please note that all pool events are weather dependent and may be canceled or rescheduled. You bring the kids - we'll supply the fun! Birthday Party packages include your own private cabana, admissions and lunch for the group. Cabana costs $40 for two hours. Per child cost, $7.50. Adults cost $9.00. Includes admissions to the pool and lunch. Lunch menu items include hot dogs, chips, and a drink. Birthday cake - you supply the cake and decorations. Due to Goodman Pool's food concession and restaurant license regulations, the cake must be a store-bought cake. Party times are available any day the pool is open and during the Recreation Swim times. Please call at least 2 weeks in advance to reserve your party. There are NO REFUNDS due to inclement weather pool closing. Staff will try to reschedule the event, but it is not guaranteed. 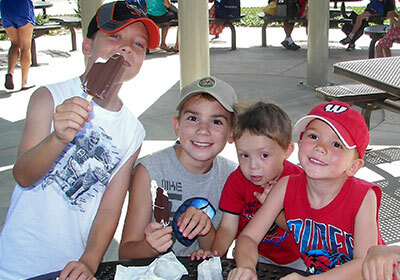 Let the Goodman Pool staff help you build the perfect party - for your family reunion or company outing. Splash Bash packages can include the rental of your own private cabana(s), admissions for your guests and lunch or dinner from our concession stand or from one of our approved caterers. You can host your very own Pool Party - even if you don't have your own pool! Goodman Pool is available for exclusive use events. Starting at $370/hour, you and your guests can enjoy everything Goodman Pool offers: zero depth splash features for the young ones, a diving well for the older ones in your group, and of course 2 incredible water slides for everyone! You can complete your party with food from our concession stand, or from one of our approved caterers.